Where I can find tutorials on Bazaar and Launchpad? Please make sure you are familiar with Task Based Development and Bazaar. Task Based Development is written with Mercurial in mind, but it applies conceptually to Bazaar. For those not acquainted to Bazaar, please read our Bazaar Tutorial. 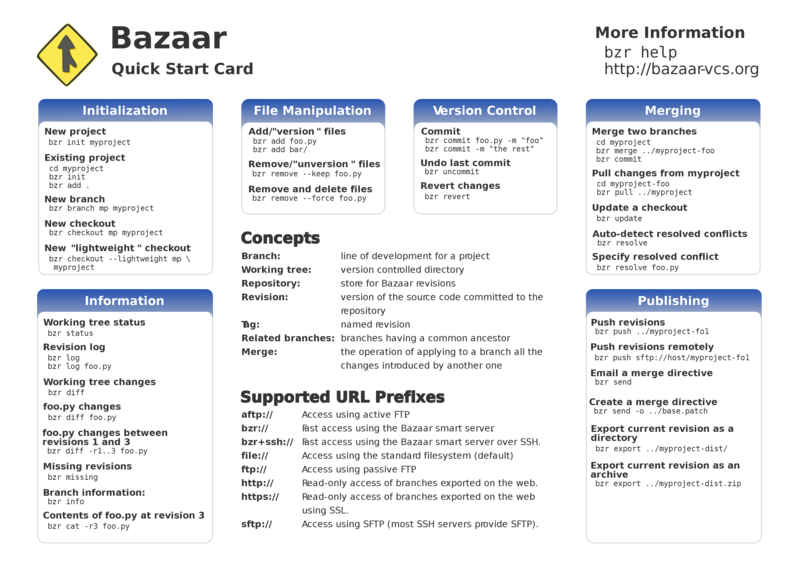 If you are not familiar with Bazaar but you are with Git, please have a look at Bazaar for Git users. Please keep in mind that your time will be wasted if you and someone else are working on the same issue without you not knowing about the other person and vice-versa. In order to avoid this situation, we need to communicate. There are several other inneficiencies not discussed here that can be avoided thru a very simple expedient: keep people informed about what you are doing. The software management platform made available by Launchpad helps a lot! But most situations can be addressed by simply sending an email to our mailing list. If you are a sporadic contributor and you are willing to keep things simple, please simply send and email to our mailing list. If you are a sporadic contributor or willing to keep things deadly simple, the answer is NO. In this case, simply jump to the next topic. This is a quick guide on the most common Bazaar commands. We also cover essential aspects of the workflow provided by Launchpad. $ bzr whoami "Richard Gomes <rgomes.info@gmail.com>"
Optional but highly recommended: Open an account with Launchpad so that you will take advantage of the workflow. In particular, being registered, you will be able to assign an issue to yourself before starting working. This is important to make others aware about what you are doing. The name trunk is intentional here: it means that you’ve obtained the branch called trunk from the repository. For Git users, it would be equivalent to master. Our issue management system at http://bugs.jquantlib.org contains the list of issues we are working on. You should be assigning the issue you are working on to yourself. Alternatively, you should be making people aware about what you are doing by sending a note to our mailing list. See our notes on stacked branches if you are interested on saving time and disk space. $ bzr commit -m "Issues #200, #201 and #202 fixed. All tests pass." where myusername is your account with Launchpad. When a project has thousands of files or too much history, we’d better consider stacked branches. In a nutshell, a stacked branch is backed by some other branch, i.e: only your changes after the branch was taken are stored in your stacked branch; all previous changes and history are kept in the original branch which backs the stacked branch. You might be confused at this point because the explanation above does not add anything different to what a branch is. You are correct: conceptually, a stacked branch works exactly as any other branch. The difference is how information is stored in the file system: the directory which contains your stacked branch contains only your most recent changes and history; all existing changes and histories are not copied when you create a stacked branch. Notice that the origin of your stacked branch is a regular branch sitting on your file system, not a remote branch sitting on the server. In other words, if you push your changes, you are pushing onto the regular branch sitting on your file system, not onto the remote branch sitting on the server.